Whole home fans don’t get the fanfare that central air conditioning systems do and we think you should know why. Basically, it all comes down to money. Whole house fan cost is far cheaper than central air systems, both in whole house fan installation costs and how much energy they use to run. They also aren’t effective in all climates, so there is a limited consumer base. But these are exactly the reasons that we think you should get one. The Bay Area whole house fan benefits from the perfect climate for this cooling system and the high price of electricity makes it the clear choice when it comes to efficiency. 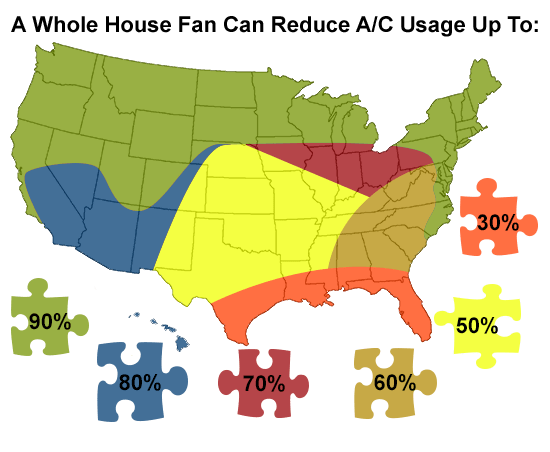 To see how a whole home fan can reduce your Bay Area air conditioning bills, first, you have to understand how it works. The fan works by creating an area of reduced pressure on the interior of your home. 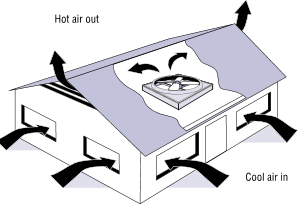 The fan pulls air out of the living areas of your home and out through the attic. As the air is pulled up it leaves a void in the living space that is quickly filled up by air coming in through the open windows of the home. The cooler air from the outside flows into the home with a slight breeze that will make your skin feel up to 7 degrees cooler than it actually is. This is because the incoming air will pull heat from your body through convection currents. Because the whole home fan moves a large volume of air, it can quickly lower the temperature in the entire house. The typical unit will be able to cycle the air in the home once every 2 minutes, or 30 full cycles per hour at low speed. At high speeds, this volume can be doubled. The whole house fan cost should really be looked at more like an investment. As you can see in the image below the overall amount you can cut your AC usage will greatly reduce your energy and turn your inital whole house fan cost into savings. While whole house fans do not work the same throughout the U.S., the Bay Area is one of the most effective places to run one. Done right, a Bay Area whole house fan installation can reduce air conditioning charges by up to 90% every year. Here’s the math on the hourly run – At the current electrical rate of around 15 cents per Kw, it charges about 25 cents per hour run a central air conditioner. An 18,000 Btu/hr window unit will be about the same. But, because a whole house fan uses a far smaller motor than an air conditioner, it ends up being around 1 cent to 5 cents per hour of use, depending on the speed that the fan is running at. With energy savings like that, you probably think a whole house fan installation cost would be expensive. The truth is they are actually cheaper than a single window A/C unit. Whole house fan installation costs will vary depending on the layout of your home, the size of the current ventilation system in your attic and various electrical factors. Don’t be surprised when we suggest adding additional attic venting. As a standard practice, You’ll need 2 to 4 times the normal area of attic vents, or about one square foot of net free area for every 750 cubic feet per minute of fan capacity to adequately vent a home. Even with the added price of additional venting, whole home fan cost is more effective than a traditional A/C unit. The EPA has noted on several occasions that one of the biggest problems with new homes is that they are so efficient at keeping air from getting in that indoor air quality can actually be far worse than that of the outside air. Pollutants that are brought in the home on dirty shoes, clothes, pets and any other item that comes through the front door. And, according to the World Health Organization, one of the biggest pollutants comes from cooking indoors. “Cooking and heating with solid fuels on open fires or traditional stoves results in high levels of indoor air pollution. Indoor smoke contains a range of health-damaging pollutants, such as small particles and carbon monoxide.” In addition to some of the short-term effects that can be caused by poor indoor air quality, the EPA cautions that “Other health effects may show up either year after exposure has occurred or only after long or repeated periods of exposure. These effects, which include some respiratory diseases, heart disease, and cancer, can be severely debilitating or fatal. ” The EPA also says, “If too little outdoor air enters a home, pollutants can accumulate to levels that can pose health and comfort problems.” By opening your windows and bringing in outdoor air, you are actually helping to remove the build-up of these potential health hazards from the house. A Bay Area whole house fan will allow you to circulate the air in your home and remove any harmful pollutants from cooking or other methods that do end up stuck in your home. This is a benefit beyond just keeping your house cooler and avoiding cranking the AC. Clean air is a bonus benefit and savings with the whole house fans installation cost. If the whole home fan is turned on when there is not adequate airflow through open windows it can create a backdraft effect. This will pull fumes from your furnace, water heater or gas-fired dryer into your living space. The deadliest of these is carbon monoxide. While this isn’t usually a factor when you are at home (because you will be there to open the windows), if you hook your fan to an automatic thermostat and forget to leave the windows open – it could happen when you are away. In this case, when you come home, you could be walking into a very bad situation. This is why we don’t recommend using the automatic fan feature, and instead, suggest that you opt for manual operation. If you find your whole house fan not working then please contact us and we’ll be happy to help get yours back up and working again in no time. Are You Ready for Your New Whole House Fan? Gentec is one of the leading Bay Area whole house fan installation companies, and we’ve been installing them for over a decade. I use one in my own house, and I can safely say that with the low whole house fan cost they really do cut my home energy bills. If you’re ready to see most of your A/C bill disappear, give us a call. We’ll show you exactly how little you’ll have to invest to see a whole world of difference.